The following material is the transcription of a lecture presented to a group of interested Bible students. The style is, therefore, more spoken than written. It is not burdened with technical argument or documentation. Several months ago, the nation’s news programs were dominated by the story concerning the young woman from California who worked as a congressional aide, and who mysteriously disappeared. Over and over again, her physical description was published — height, hair color, eye color, and distinguishing characteristics. By virtue of that detailed description, there was hope that if someone should see her, she could be identified and brought home to her worried family. Every day in our lives we encounter occasions in which we have to identify certain objects. If we go to the supermarket to shop, and we return to the parking lot, we have to identify the particular vehicle that belongs to us. If a mother’s child becomes separated from her in a large crowd, she can provide an identifying description to those who may be able to locate that child. Perhaps the most important application of that principle is this: Is it essential that we be able to identify the church of the New Testament — the one that God planned, and the one that Jesus purchased by the shedding of his blood? Is it important that one be able to identify that spiritual body? Can it be found in today’s world? Tragically, many sincere religious people operate on the premise that it really doesn’t make any difference what church one belongs to, so long as it is under the general umbrella of “Christendom.” But is that a valid premise upon which to operate? Here is an abbreviated definition of a mammal. A mammal is a creature characterized by certain traits. It has hair. It is warm-blooded. And mammals nurse their young. The English word “mammal” derives from a Latin word, mamma, which is the term for breast, having to do with the suckling of the offspring. A dog is a mammal. A dog has hair, is warm-blooded, and suckles its young. A cat is a mammal. Human beings are mammals — according to this definition. A whale is a mammal, having all three of these characteristics. But a bird is not a mammal. Though a bird is warm-blooded, it does not have hair, and it does not nurse its young. A caterpillar is not a mammal. A caterpillar has hair, but does not nurse its young. A mammal has all the previously mentioned traits. Moreover, to have Heaven’s sustained approval, a group of Christians must attempt to conform to those particular qualities that characterized the church as it functioned under the guiding hand of the inspired leaders of the first century. “Repent and be baptized, every one of you in the name of Jesus Christ, for the forgiveness of your sins, and you shall receive the gift of the Holy Spirit” (Acts 2:38). Luke, the writer who recorded the events, said they who gladly received Peter’s words were baptized, and there were added together, that day, about 3,000 people. From that time on, in the book of Acts, we read that the church is in existence. Prior to that time, all references to the church are in the future tense. Jesus, for example, had said in Matthew 16:18, “I will build my church.” That was about six months before he died. But from Acts 2 onward, the church is in existence. And so, we conclude that the church was established at that time. The year is approximately A.D. 30. The day was Sunday. The method by which they constituted the church was submission to the gospel message. Those who attempt to become Christians in any other fashion are not members of Christ’s spiritual body. Now, what about the church of which you are a member? Was your church established in the city of Rome, several centuries after the New Testament was completed? Was your church set up in London, in the 1600’s or 1700’s? If so, it is not the church of the New Testament. The church of Jesus Christ traces its origin to the events recorded in Acts 2 — twenty centuries ago. Let me ask you this. What was the pattern of church organization, as we read of such in the New Testament? Well, the issue is rather simple. First, Christ is the head of the church. He is “the head of the body, the church” (Col 1:18). The church of the New Testament had no earthly head — some person allegedly governing by the authority of Christ. Rather, Jesus is the only head of the church (Eph. 1:22-23). Does your church have a single pastor with a board of deacons that governs the local congregation? If so, you are in a church that is not organized after the Bible pattern. Is your church subject to a “bishop” who exercises authority over a conglomerate of congregations? There is a fundamental flaw in that system. Then there is the matter of worship. What is the worship procedure in the church of which you are a member? A survey of the New Testament record reveals that several different acts were engaged in whenever the church met on the Lord’s day to worship God. We are told, for example, that the early Christians assembled themselves together on the first day of the week — and every Lord’s day (see 1 Cor. 16:2 — NASB) — for the purpose of partaking of the communion Supper. This involved eating the bread and drinking the fruit of the vine (Mt. 26:26ff; Acts 20:7). Is that what your church family does? Does it meet each Lord’s day for the purpose of observing the communion? Or are you identified with a group that observes the Lord’s Supper quarterly, or semi-annually, or even only yearly? Or perhaps at some other random time? If so, I must tell you with compassion and kindness, that such does not conform to the biblical pattern relative to the observance of the communion. The Lord taught his disciples to pray to God, i.e., to deity (cf. Matt. 6:5ff). After his ascension, they continued in this practice of speaking only to the Lord (Acts 2:42). Does your church offer prayers to those other than God, such as idols, or to Mary, or “the saints”? If so, those prayers are ineffective. Christ’s church prays as he instructed. On the Lord’s Day, there was also the practice of preaching the word of God. In Acts 20:7ff, when the disciples came together on the first day of the week, Paul also taught the brethren, and continued his communication for a considerable time (cf. Acts 2:42). In addition to the teaching program, the early church engaged in singing as a form of worship. Ephesians 5:19 underscores the corporate nature of the musical portion of church worship (cf. Col. 3:16). The inspired apostle wrote these words: “Speaking one to another in psalms, hymns and spiritual songs, singing and making melody in your hearts unto the Lord.” Singing is an expression of praise in which every Christian within the congregation should engage. “Oh,” but someone objects, “musical instruments are mentioned in the Old Testament!” Yes, they are, but the Old Testament reflected a very elementary scheme of things, a carnal system (see Heb. 9:10). The Old Testament contained the offerings of bloody sacrifices. The Old Testament had the burning of incense. The Old Testament had a physical, tribal priesthood through whom the rank and file of the people approached God. But that carnal system was laid aside, as the writer of Hebrews argues, in chapter nine of that document. The Old Testament regime was superseded by a spiritual system. The early church, on the first day of every week, contributed into the common congregational treasury, that the Lord’s work might be expediently financed (1 Cor. 16:1-2). The modern practice of engaging in business enterprises to underwrite the work of the church was not a part of the original pattern of church economics. So it was, then, that the primitive church observed the Lord’s Supper, prayer, singing, teaching, and the weekly contribution. Does the church of which you are a member practice these items — as per the New Testament pattern? If not, then it does not conform to the New Testament mold; it does not fit the ideal of the early church, as such existed under the supervision of the apostles of Christ. Don’t you want to be affiliated with the church of the Bible? Is it not possible today to be a part of the original church without any affiliation with a church organism that has adopted merely some of the elements of Christianity? There were several appellations employed to describe the first-century believers, e.g., disciples, saints, brethren, etc. But beginning in Acts 11, the early disciples were formally called Christians — first at Antioch of Syria (Acts 11:26; cf. 26:28; 1 Pet. 4:16). Why would men set aside that name, and designate themselves by human heroes (e.g., Lutheran)? Or name themselves after some form of organization, (e.g., Presbyterian)? Or adopt titles according to some individual point of doctrine they espouse, (e.g., Baptist)? There is no scriptural basis for this common practice. Tell me please, why are those who profess allegiance to Jesus Christ dissatisfied with simply wearing the name “Christian”? Why are they not known as just “churches of Christ” (Rom. 16:16) or “churches of God” (1 Cor. 1:2) — either appellation being entirely scriptural. There is no solitary, exclusive name for the church. But whatever you call it, you need to call it what it is, and not what it is not. Finally, I would ask you this question: “What does your church teach in terms of how to become a Christian?” I can tell you this, if it does not teach exactly what the Bible teaches, there is no way it can be identified as a church of the New Testament. The apostles and other inspired teachers of the first century, as they went forth proclaiming the basic facts of the gospel, first of all instilled within people the need to believe basic facts concerning Jesus Christ. Jesus himself said in John 8:24, “Unless you believe that I am he, you will die in your sins,” and he also affirmed that if one dies in sin, he cannot join the Lord ultimately (Jn. 8:21). That is plain enough. There is a church called the Universalist Unitarian Church. It claims to be a “Christian” church, but I must tell you this. You do not have to believe that Jesus Christ is the Son of God to be a member of it. You do not have to believe that Jesus was born of the virgin Mary. You don’t have to believe that he performed the miracles attributed to him in the New Testament record. You do not have to believe that he was raised from the dead. Any church that teaches that your personal life need not be altered, so long as you go through a ritual to obtain “absolution,” thus suggesting that you may continue to pursue your sinful lifestyle, cannot be the church of the New Testament. The church of the Bible demands reformation, a change of one’s life. Some people think that it is not very important to understand the purpose of baptism. As long as you understand that it involves going under the water, that would be sufficient. Many churches don’t even believe that. Tragically, many of our religious neighbors, whom we admire for so many noble traits, practice the sprinkling of water upon babies. There are two mistakes in that procedure. Do you belong to a church that baptizes infants? Then you are not a part of the New Testament church. Do you belong to a body of people that sprinkles water when a candidate requests baptism? That’s not the Bible church. Do you belong to an organism that teaches that you are saved at the point of faith and therefore, you need only be baptized to show that you are already a child of God? My ancestors believed and taught those ideas. But they were wrong about such matters. Would you think about this very seriously? And if you have not obeyed the truth, the whole truth, and nothing but the truth, do so with all dispatch? As soon as you’ve reached a firm conviction about your spiritual state, and have an understanding about what the Scriptures teach, do not hesitate — obey the truth. You can then know, with confidence, that you are a genuine Christian. 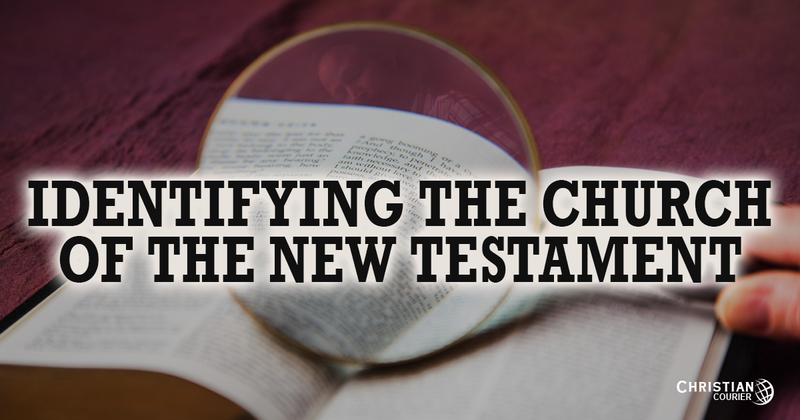 You will be a member of the church that is found in the New Testament — one that cannot be wrong, because it has the divinely-prescribed identifying traits.